Oh man I love how these came out. My Son is obsessed with Minecraft and he thought these were awesome. They were also the perfect thing to paint on my nails for the green prompt because they use so many shades of green. To create this look I first painted my nails with Ulta3 Kiwi Kaos. I then did random dots all over my nails using about 5 or six shades of green. 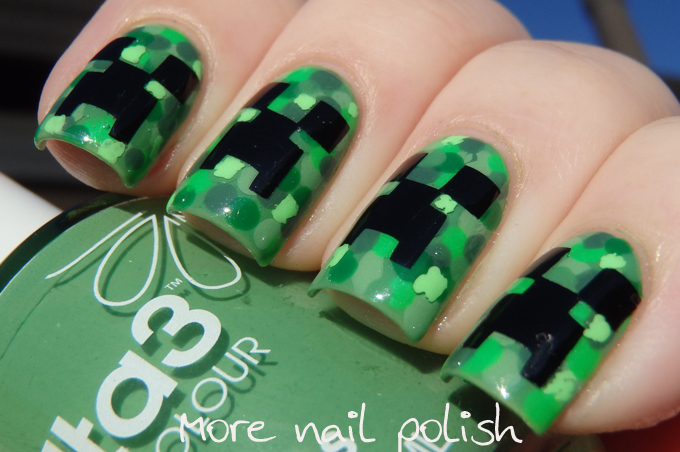 I used the Creeper nail vinyls that I received from Loki's Nail Vinyls. 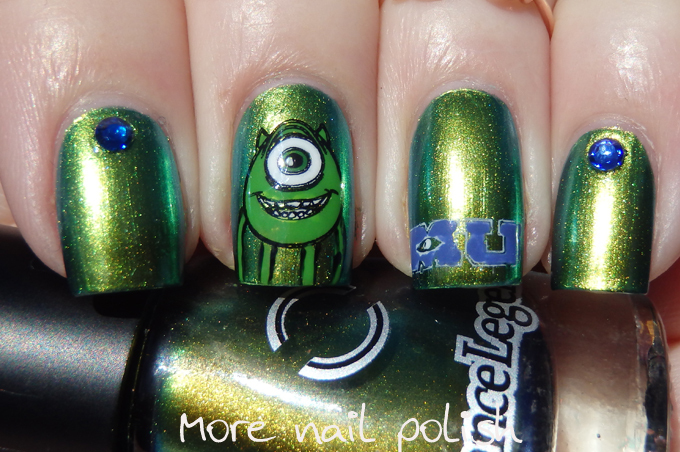 With out them I don't think this mani would have turned out anywhere near as good. So far I've only ever used vinyls as stencils to paint over and then peel off. In this instance I just stuck the vinyls down on my nail and put top coat over them. So simple and so effective. 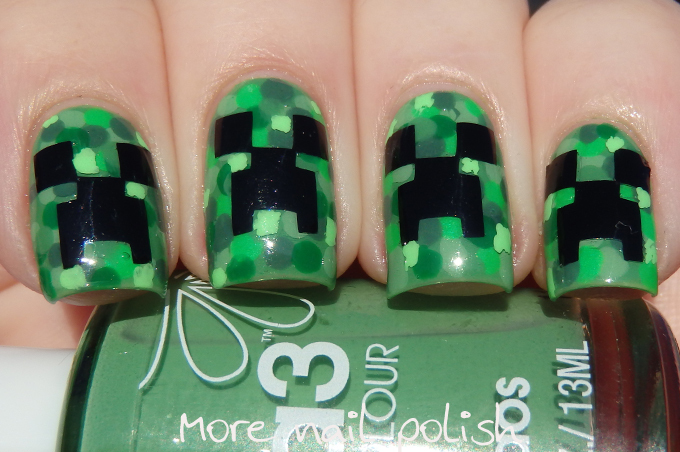 It was only after I had applied the vinyls that I realized that I hadn't used a light shade of green, especially when compared to an actual creeper image, so I had to add the light green ones in after the vinyls. In these close up photos you can see the unevenness of those ones compared to the others. 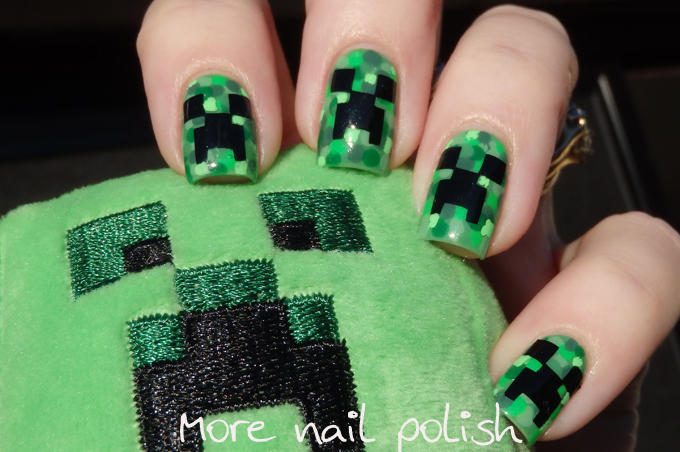 Even though the Creepers design is very square for the other colours, using a dotting tool and only having round dots didn't make a difference at all. Effect achieved 100%. My Green nails from 2013 and 2014! 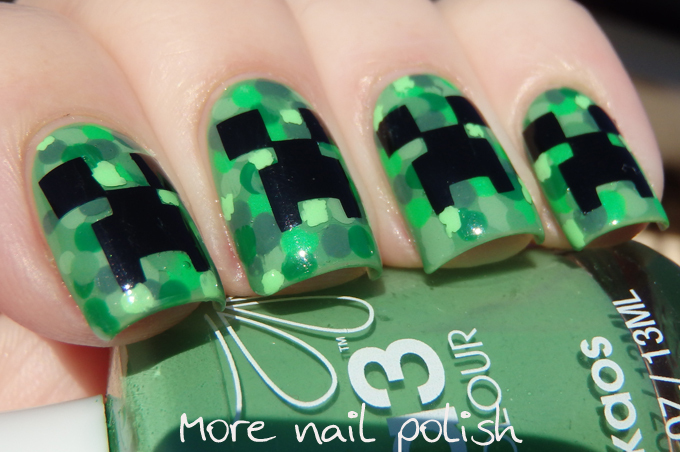 Ohhh Minecraft is one of my favourite games and this manicure is spot on! Love the effect and the vinyls! For quite a few of the colours I used the same green shade, and just added a drop of either white or black to change the shade. 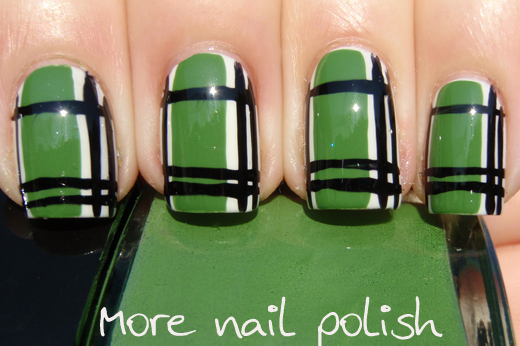 you could probably get away with just two green polishes doing this. These are amazing! Such a great idea for green.